The sight of ancient ruins emerging from the jungle has always captured the imagination. 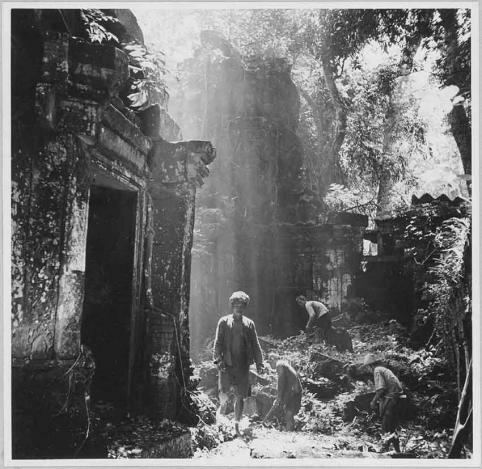 When recorded in early black and white photographs these images, swathed in mystery, are even more evocative and nowhere more so than in the jungles of Cambodia at Angkor. The lost city, submerged in tropical forest after its demise in the 15th century, remained almost impenetrable until 1860 when the French explorer Henri Mouhot, one of a number of early visitors, captured its magic in drawings and written descriptions. His posthumous diary was subsequently read out at the Royal Geographical Society and a new generation of travellers followed in his footsteps, including the first photographer in 1866, Scotsman John Thomson, and the colonising French. When Cambodia became part of Indochina in 1887, French scholars descended on the country to study and restore the vast ruins and temples that would eventually reinstate the country's heritage and become the jewel in the crown for France's achievements in its empire. The prestigious institution set up for this purpose was L'Ecole Française d'Extrême Orient (EFEO, The French School of the Far East), founded by Auguste Barth and composed of brilliant archaeologists and artists under the initial direction of Louis Finot. From 1907, when Angkor was ceded back to Cambodia by Siam, these dedicated men uncovered what is considered today to be the biggest pre-industrial city on earth with, at its heart, the biggest religious monument in the world, Angkor Wat. An archaeological park was created in 1920 and a succession of remarkable conservateurs included Jean Commaille, Henri Marchal, Georges Trouvé, Maurice Glaize and Bernard-Philippe Groslier supervised the work. With photographers in tow, using early photographic techniques such as the ‘wet-collodion' process, a time-consuming operation with heavy equipment, their records were not only hauntingly beautiful but of outstandingly high definition, creating a visual inventory of a site that would eventually be affected by war, theft and further neglect. They captured that sense of mystery of ruins overgrown by vegetation, of a lost world and the transience of life. One of the world's most photogenic places, Angkor has been immortalised by innumerable photographers from Henri Dufour and Charles Carpeaux to Marc Riboud later and Jaroslav Poncar today. An exhibition of 108 of these photos, Archaeologistsat Angkor: Photographic Archives from the Ecole Francaise d'Extreme Orient, opens at the Cernuschi Museum in Paris in September. Taken between 1860-1960, these images, from a collection numbering more than 100,000, show the temples before and after clearing and conservation, still surrounded by huge, clinging figtrees and tropical foliage, giving them incomparable romantic appeal. Of the many monuments, three have been specially chosen as the focus of this exhibition: Banteay Srei, the first temple to be rebuilt in the 1930s by anastylosis, the method whereby a ruined building is reassembled stone by stone using the original architectural elements; the Baphuon, a massive temple mountain under restoration by the French since 1943, involving 300,000 stone blocks, scheduled for completion in March 2011; and Neak Pean, an artificial island with a small Buddhist temple which was earlier restored and remains a place of unique artistic interest and atmosphere. The earliest picture of the exquisitely carved,miniature red sandstone 10th-century temple of Banteay Srei is 1924, taken by Henri Parmentier, another of EFEO's outstanding members and head of the archaeology department. This temple was discovered in 1914, in the jungle about 25 kilometres north of the main complex. As it is now one of the most visited at Angkor, and roped off so that tourists walk around the edge, the pictures are all the more interesting. It was found by a French officer with the Geographical Service, Lieutenant Marec. It was famously looted in 1923, before its restoration, by André Malraux, later France's Minister of Culture, who hacked away a devata from the stonework but was intercepted with it en route to Phnom Penh and imprisoned, although later released. Work on the temple started in March 1924, consolidating the entry pavilions and first and second enclosures, under the direction of Parmentier and Victor Goloubew. In 1931, Henri Marchal undertook restoration by anastylosis, pioneered at Borobudur and Prambanan in Java, and chosen for this temple because of its small size and exceptionally rich decoration on pediments and lintels, from elaborate foliage and vine scrolls to lotus flowers, mythological animals and narrative reliefs from Hindu mythology. Pictures from 1931 show Cambodian workers (many Cambodian archaeologists were trained by the French) dragging the stones of the southern tower with bamboo poles and ropes. ‘This reconstruction', wrote Marchal ‘stoneby stone, never executed in a Khmer temple before, has unveiled several defective construction procedures hitherto disguised by the virtuosity of the carved facades'. By May 1934, an anonymous photo reveals the north library fully reassembled, although still surrounded by bamboo scaffold, with Marchal and a Mr Chan examining a map of it. Marchal had started in April - a challenging period in a monsoon climate just before the rainy season - and his notes state that they were pressed for time. Scores of blocks of sandstone lie around still waiting to be put back into place, like a giant jigsaw puzzle. By 1962, photos taken by Luc Ionesco, a professional photographer who had worked at Réalités, the art magazine, show the finished library's eastern façade in all its perfection. The false doorway of the north façade is surmounted by a succession of three polylobate frontons, meticulously carved with ornamentation and a narrative relief of the Vishnu legend, showing the Rain of Indra, god of storms, mounted on his three-headed elephant (now reinterpreted by Vittorio Roveda in Images of the Gods as the Burning of the Khandava Forest). Another of Ionesco's photos shows the ideally proportioned, epicene dvarapala, guardian of the west false door of the central sanctuary, holding a staff in his right hand and a lotus in his left, a relief of great refinement and sophistication, surrounded by a wealth of floral and vegetal decoration. One of the temple's most magnificent pediments, showing a scene with the apsara Tilottama from the Mahabharata, the Hindu epic brought from India and adopted by the Khmers, is in the Musée Guimet, while another is in the National Museum in Phnom Penh. Banteay Srei, often described as the ‘Jewel of Khmer art' and built by a Brahmin rather than the king, Rajendravarman, was a favourite of Prince Norodom Sihanouk, as was the nearby Banteay Samre, a small, elegant temple featured in the exhibition with the Prince at the western pavilion in 1941, standing with a French official. The much larger Baphuon, a vast 11th-century temple probably started by King Suryavarman I, was crumbling and collapsing when the photograph from 1943 was taken. Marchal noted that in the dry season the danger of falling masonry was less, so restoration could be started on the giant recumbent Buddha set against the western façade, formed from the stones. The second and third levels had collapsed in a landslide and the laterite foundations had to be consolidated. The monument had a long causeway with columns and cruciform pavilions, comparable in size to Angkor Wat. Marchal alludes to the difficulties of raising the huge blocks of stone and the danger of the unstable scaffolding which slowed down their work. Only a few pediments remain and the walls are decorated with reliefs showing animals and trees in landscapes. A picture from 1938 shows the eastern gopura (tower), with reliefs on the northern side of a scene from the Mahabharata, with the Pandavas and the Kauravas, the two dynastic clans. One panel shows Bishma, on the side of the Kauravas, transfixed by the arrows of Prince Arjuna, leader of the Pandavas. Admiring these carvings in recent years has been impossible as the monument has been closed to the public while work on it continues until completion next year, although certain areas can now be viewed. Many superb photos of Angkor Wat, some with monks on the causeway, others with elephants and ox carts, feature in the exhibition. From 1963 is an early aerial view, revealing the symmetry of the layout of Angkor Wat, with its galleries, courtyards and moat. But more compelling is one of the first ever taken by John Thomson, in 1866, replete with encroaching jungle and swaying palm trees. How silent Angkor must have been then, with only the sound of birdsong and cicadas to disturb the peaceful and sacred atmosphere. Angkor Thom and the mystical Bayon, dating from the 12th century, are captured by Parmentier with all the haunting qualities of black and white photography, imbuing the brooding face towers with even greater enigma as they appear to loom from the jungle like ghosts. Of the same period as the Bayon, the temple of Ta Prohm, consecrated in 1186, is still overgrown with forest, a favourite with visitors for its sense of a lost domain and captured in magical pictures from the 1930s. In an ethereal one from 1952, the sunlight filters through the leaves on a shrine with a worker in the shadows clearing the path. The EFEO's main concern was to secure these buildings from imminent collapse and preserve them from further destruction. The trees often protected the ruins, especially from the ravages of tropical rainstorms, and the roots, which snaked through the monuments destabilising them ended up by supporting them. But the French chose to leave at least this one temple as it was when first seen by early explorers hacking their way through the forest. Those who first saw Neak Pean witnessed the forces of nature completely overwhelming a man-made structure. In this temple on a circular island set in a square pool at the centre of the reservoir, the baray, of Preah Khan, banyans and silk cotton trees smothered the stones. Tree roots curled around a deeply carved image of an Avalokitesvara in hieratic pose with his arms by his sides, standing on a lotus. Parmentier's evocative 1933 photograph, done with the gelatine silver bromide process, reveals the central tower completely hidden by the huge banyan which appears to grow out of the top, its roots precariously holding up the walls. The picturesque charm of Neak Pean persuaded curators to leave the tree intact, to the detriment of the tower. However, in September 1935, a violent storm destroyed it and restoration by anastylosis was subsequently carried out on the tower, under the auspices of Maurice Glaize. It was completed in 1943. During the rainy season, the pool in which the tower stands fills up, recreating the mythical lake of the Himalayas whose waters were reputedly beneficial for health and used for ritual ablution. In it is an unusual sculpture of the legendary horse Balaha, incarnation of the bodhisattva Avalokitesvara, which carries stranded sailors who cling to the animal. Even today, amid the crowds of visitors, Neak Peak radiates a sense of serenity and other worldliness. Iconography and epigraphy were the ways that French scholars dated these temples, dividing pre-Angkorian and Angkorian art into a series of styles. They also opened up the site for the first tourists, creating paths around the monuments called the Grand Circuit and Little Circuit. Angkor also became the centrepiece of France's international colonial exhibitions, first in 1906, then again in 1931, with gigantic plaster cast models of the principal temples. All these were recorded by photographers at a time when Cambodia was part of an empire in which the French sought not only to colonise but to study an area that gave them prestige. Since then Cambodia's troubled history has resulted in theft, destruction and loss of sections of temples and reliefs. These images therefore provide an invaluable record of a place that time had forgotten. But their allure ensured it would never again be overlooked. Today Angkor, a UNESCO World Heritage Site, is both a huge tourist attraction and a magnet for scholars from all over the world who bring new methods of study with satellite imagery and computer generated tools. These old photographs are a nostalgic reminder of the sight of those ancient ruins emerging from the jungle, silent and mysterious, images that still capture the imagination. From 10 September to 2 January 2011 at Musée Cernuschi,7 Avenue Vélasquez, 75008 Paris, tel +33 01 53 96 21 50. Hours: Tues- Sun,10-6. Closed Mondays. A catalogue accompanies this exhibition with sections onAngkor’s history by such august scholars of EFEO such as Claude Jacques, Bruno Dagens,Pierre Pichard, Christophe Pottier and Francois Lachaud.